It’s humanity’s sacred right to fail. should never have been a novel. …another disappointment in June’s doggedly optimistic life, they begin the long trek back to Seattle. When inclement weather forces them off the road, June gets caught in a flash flood incident that leaves her stranded and injured in the middle of nowhere. Rescued by a mysterious hot-rodder, she is thrust into yet another post-Joycean world with even more surreal elements. Here she begins to sense that this strange but benevolent character may actually be the fabled “Seattle Capper” himself—the unseen phantom responsible for a history of distributor cap thefts—and the same one who stole their cap in Arizona while the band was enroute to Austin. 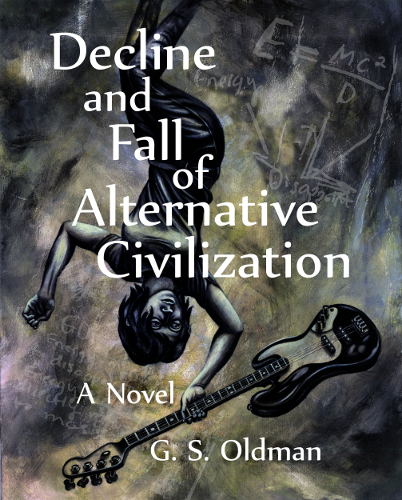 Decline and Fall of Alternative Civilization is literary fiction that may appeal to misguided men, unsettled women, disgruntled music enthusiasts and anyone fond of examining the strings from which physicists’ yoyos spin. A multi-voiced recording produced by SPOT. Currently available thru Amazon, Google Play, Playster, Nook, Scribd and iTunes. Ebook version available for $0.99 on Amazon and Smashwords. More audio excerpts are posted on Soundcloud, YouTube and the 101st Monkey page.